Are you in search for Wipro Off Campus 2018 drive for freshers? Then this is the right place to get all the updated information in a detailed manner. The current article is equipped with all the necessary details for the job seeking candidates who want to get placed in Wipro. In this drive, Wipro focuses more on talented fresher graduates and postgraduates throughout the country. Prior to the start of the application process check the complete article and be sure that all the specification was satisfied. To make the application process simple we have provided a Wipro Off Campus registration link. 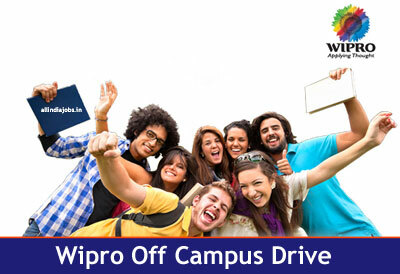 By accessing the given link candidates can apply online for Wipro Off Campus drive. This is a huge opportunity for the aspirants seeking a job opportunity and the complete information provided in this article. Check below information for further details like eligibility criteria, salary, selection procedure etc. Those candidates seeing themselves in Wipro Off Campus 2018 Drive were requested to go through the complete article. Wipro also organizes Off Campus drives through eLitmus and AMCAT exams. Getting a job in Wipro is a dreaming job for most of the freshers. A well planned preparation is must for all the participants in order to get qualified for the written test and Interview. Be careful while attending the interview. Applicants will be selected on the basis of their performance at the rounds of selection. To help the aspirants in their preparation go through some Wipro Placement Papers and Wipro Interview Questions. For further help check Wipro Syllabus and Wipro Test Pattern which can be viewed from our site www.allindiajobs.in. BE/B.Tech, ME, M.Tech, MCA, BCA, B.Sc, B.Com, BA, BBA, Any Graduation candidates are eligible to apply. Mathematics should be a compulsory subject in 12th. The gap between years of study should not be more than one year after graduation. The written test is for 90 minutes covering the areas of verbal, analytical and mathematics. Questions from trigonometry, calculus, differentiation, algebra, integration, matrices and coordinate geometry will be asked. In graduation, they must obtain 60% of aggregate. The aspirant should have an aggregate of 60% in 10th and 12th Standard also. Applicants holding backlogs are not eligible to apply. If the candidate is having any backlogs in any of the years then they should mention them while applying for Wipro Off Campus. Make a click over WIPRO careers registration (Apply Here) link. Enter the details in the specified fields and also upload your latest resume. Diploma / Graduate / PG – All Mark sheets Semester wise & Consolidated Mark sheets. Final Degree certificate / Provisional Certificate / Course Completion Certificate. Passport Copy / Acknowledgment copy of the application. PAN Card / Acknowledgement copy. NSR Registration / Acknowledgement copy. Candidates selected in Wipro Off Campus Drive as a fresher can expect the wage to be in between Rs.3.18 lakhs to Rs.3.30 lakhs. Check the below provided instructions as they are helpful for the candidates to crack Wipro Off Campus Drive. For freshers, this is a big opportunity to start their career. With a proper planner, you can easily get qualified over the rounds of selection in Wipro Off Camus Drive. Applicants must be good at communication skills. Refer all the core subjects prior to Interview. Prepare with some Wipro Syllabus and Wipro Test Pattern. Maintain key observation over the situation around and respond spontaneously. Read all HR Interview Questions and Answers. Organize several Practice sessions over Wipro Placement Papers. Be confident maintain good eye contact at the time of Interview. For all the job seekers All India Jobs is the right place to get all the latest news related to the job offering in the present market. Hope this article is a token to help for all the freshers appearing for Wipro Off Campus. Bookmark us so that you can visit us directly. Thank You. I am shruti dupadal ,I have completed BE(cse) vtu with 63% aggregate.and I hav completed course on Java in uttara info solutions rajaji nagar .also I have good knowledge in sql … just now I am looking for job in IT/software field to start my career. Hi I’m Radhika. I completed computer science and engineering with 68.35% I’m looking for a job as a software developer I need a reference . Please contact me through radhikapatilnov1@gmail.com. . I am completed BCA Kuvempu University. I am Dheventhiran. I have completed in Deee. i m indu rawat , i am done m b.tech in ece stream batch was 2011 to 2015 with 67.07% . m i eligible for this job.. I am 2018-2019 batch MSC(Computer Science)student ,so i can apply for offcampus selection process.